Upriver spring Chinook: The 2012 forecast is 314,200 fish entering the Columbia -- 168,000 Snake River fish (39,100 wild) and 32,600 upper Columbia spring Chinook (2,800 wild), with the remainder of the run returning to mid-Columbia tributaries. That’s nearly 100,000 more than the 2011 run of 221,200. Summer Chinook: The 2012 forecast is for 91,200 fish, which would be the highest return since at least 1980, and 135 percent of the 10-year average (67,500 adult fish). The 2011 run totaled 80,574. Sockeye: The 2012 sockeye forecast is a whopping 462,000 fish, which includes 28,800 to the Wenatchee River, 431,300 to the Okanogan River, and 1,900 to the Snake River – in all, 348 percent of the recent 10-year average. The 2011 return was 187,300 fish. The 1,900-fish forecast for the Snake River would beat last year’s 1,500, which was the second-highest observed since at least 1980, trailing only the record return of 2010. That’s an impressive improvement from the 1990s, when the run dwindled to single-digit returns. Upriver summer steelhead: The 2012 forecast is 380,300 fish, which is 95 percent of the 10-year average and very similar to the 2011 return. 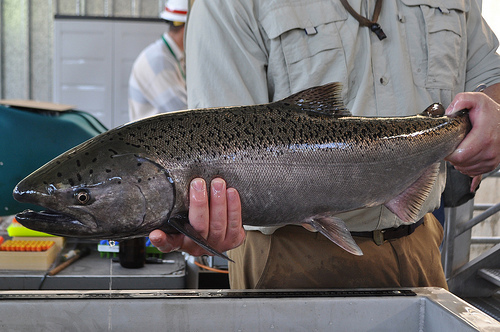 Upriver fall Chinook: The estimate for 2012 is 483,500, which would be more than in 2011. The upriver-bright component, fish that spawn in the Hanford Reach primarily, is expected to be 353,300 fish, which is nearly 100,000 more than the 2000-2011 average of 257,000. Snake River wild fall Chinook: The run was estimated at 14,900 in 2011, and about the same number are expected this year – approximately double the 2000-2011 average of 8,100 fish.